It seems the holidays never end. I think that’s a pretty popular sentiment this time of year. I recently had another holiday party to go to, so of course, I took a cake! 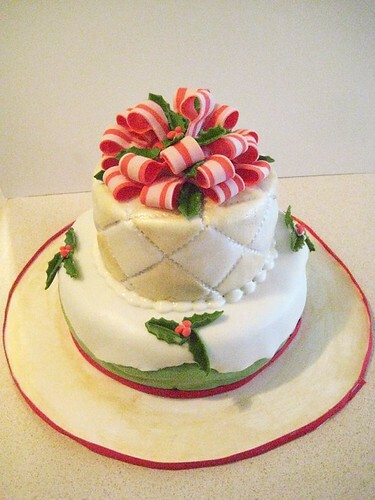 The top tier of the cake below is maple walnut cake with maple buttercream frosting, while the bottom tier is chocolate cake with peppermint buttercream frosting. Yes, that’s exactly the same as the cupcakes I made for another holiday party. Yes, the two parties were just a day apart. And no, I can’t think of any flavours more holiday/season specific than maple and chocolate with peppermint. Don’t judge me! This took quite a bit of time to concoct, but it was worth it. I struggled a lot with the quilt design, since I’ve never done one before. And I sort of ran out of bows for the topper. Lesson learned. Always make twice as many as you think you need. And my royal icing was a bit runny, so my border looked… interesting. And no, I don’t know what prompted me to paint my cake base with gold luster dust. Again, don’t judge me!